An ancient, monstrous SCARA robot arm, open sourced servo-motor drives, and an ABS extrusion print-head with Linux-CNC gluing everything together. 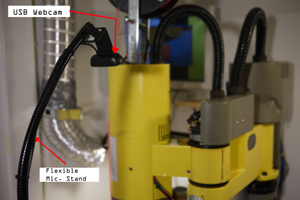 This project documents the re-purposing of a 'rescued' 1980's IBM 7575 SCARA Robot Arm, into a functional 3D ABS printer. The project features some motor upgrades [listed earlier], documentation of encoder positioned motor control feedback theory, the interminglings of EMC2 [Linux CNC], heated workspace construction and a step by step overview of transitioning from 3D stl model to 3D g-coded structure. The huge reach of the 7575, allows for printing large objects, (roughly ~25"x12"x6.5" maximum). Some of these prints are shown below. 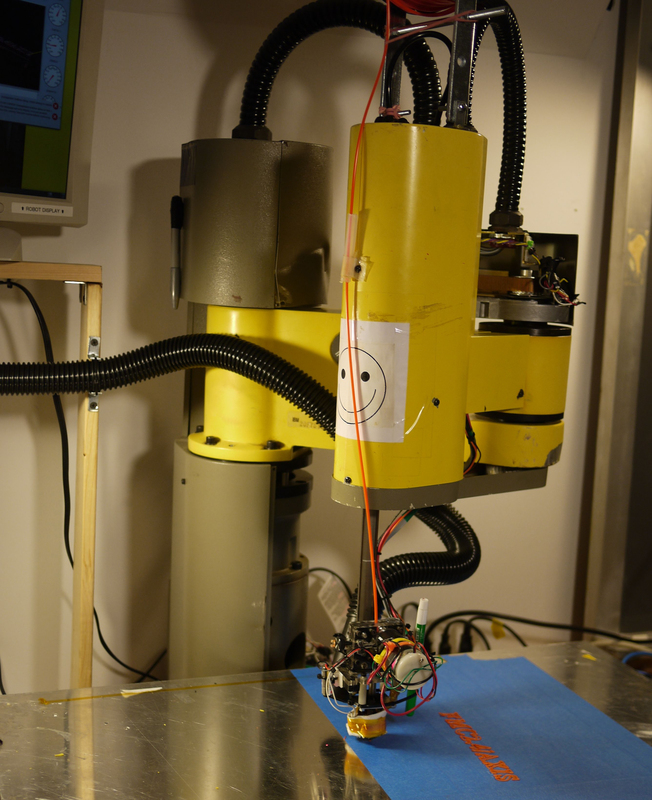 The following is a demo video of the IBM 7575 robot-arm-abs-printer tackling some earlier medium sized prints. Note this is running from the developed hardware detailed below, not the stock controls hardware. All hardware to computer interfacing is done over the DB25 parallel port. The robotic arm this project is built around was scavenged from a lab clean out. Unfortunately, the motor drives, servo amplifiers and control hardware was nowhere to be found, so suitable replacements needed to be sourced/designed to drive each axis. 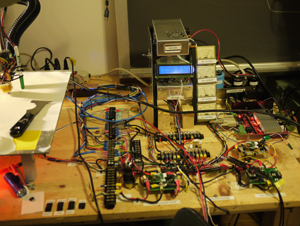 The arm initially ran from 4 DC Servo motors with high-precision encoders. 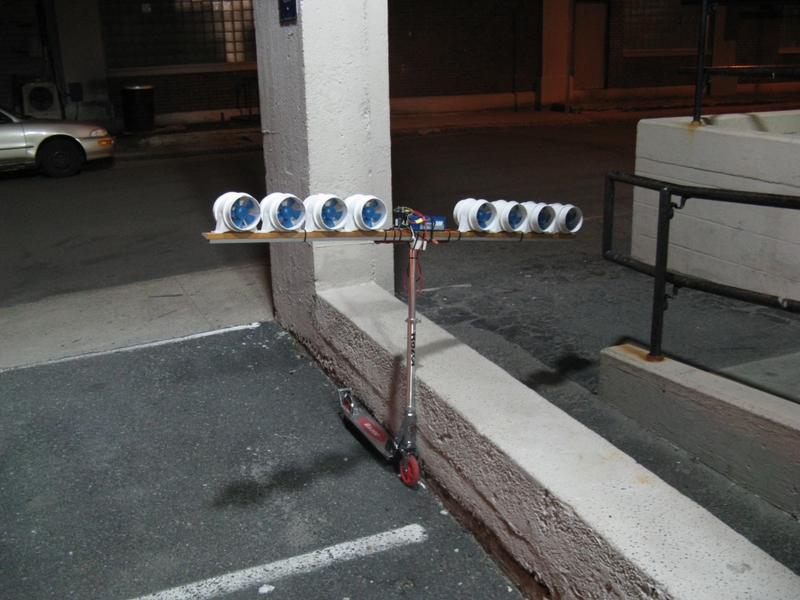 Each motor would tie into a corresponding PID feedback controller to allow for precision positioning. The DC motor provided the high-torque low RPM drive, and the precision encoder provided precision position feedback. 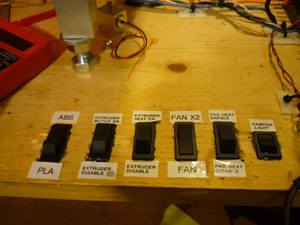 Presently, a number of 3d printers on the DIY front, rely on feedback-less stepper motor assemblies. Using high-power steppers, sized much greater than the application's torque requirements, in conjunction with a driver that maintains a holding torque throughout operation, the printers can skip feedback systems and still preform remarkably well. For this project i opted for a mix of the two. To get this working i took the 'iterative' approach, started with basic motor controls, worked through each issue, and incrementally tuned better accuracy, tighter feedback loops, and increased functionality. 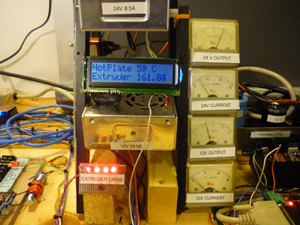 The heated build platform consists of a 1/8th " aluminum plate, donated by a colleague, and six 25W power resistors. Teflon coated wire (rated for 150C) was used for wiring the resistors in series. 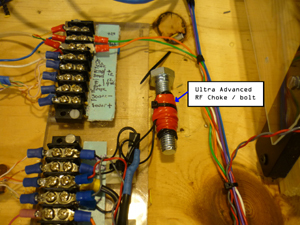 The heated build platform is fed from a 24v 8.6A supply, tuned to 26V. The heater assembly dissipates roughly 200 watts. 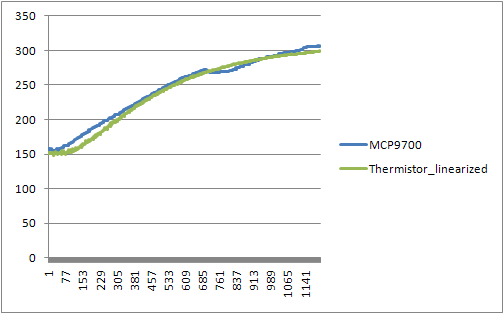 Two linear temperature measurement probes, each using a separate Microchip MCP9700 (link) feed temperature back to the main Temperature/Heater controller. After a 6 minute warm up time, the build platform reaches 65 Celsius, near the stress relaxation point of the ABS plastic used in the printer. Its also, fortunately, right below the 'argh, i singed my hand' temperature threshold. I used a number of 2 position slider switches for the various settings on the robot, and also to disable some functions when code went awry. My goal for the robot controls was to keep things as simple (and cheap) as possible. 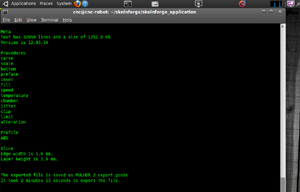 To do this, i made use of Linux cnc's great tye-in with real-time parallel port data output. The system topology can be broken into four main components. Each motor drive is broken into 2 signals, 'Step' and "Direction'. A 'Step' is effectively counted as a rising edge on the step line and informs the controller to increment the motor position by one point. 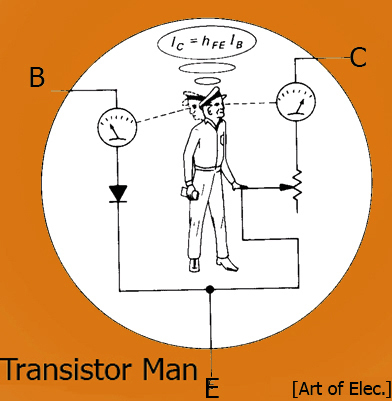 Before making any movements, the 'direction' bit is read, if its a logic 0, counter-clockwise motion is used, if its a logic 1, clockwise motion is used. The physical 'step' and 'direction lines are generally tied to isolated parallel port pins. These pins are called from Linux cnc, and control the robot's motion. For the main axis, a giant DC motor with encoder is used. Opting for replacement with a stepper proved difficult and potentially very expensive. To drive this motor i developed a high-current H-Bridge that could use encoder data to position the motor. 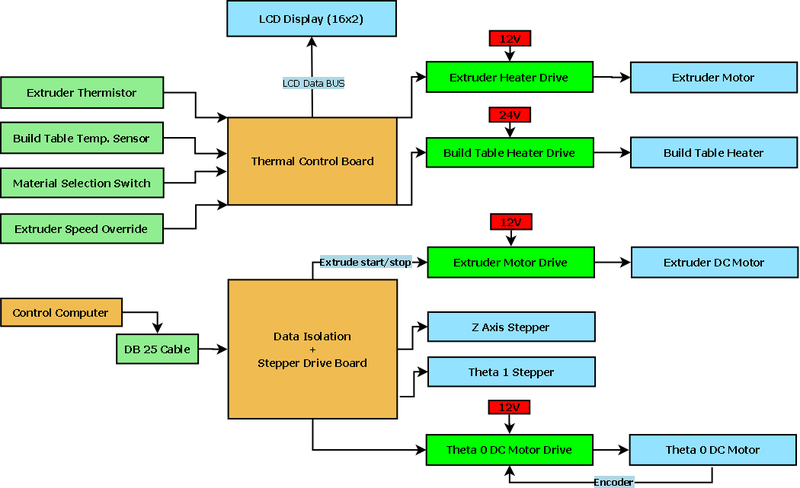 To drive a DC-Brushed motor with encoder in a similar fashion as a stepper, a relatively high-speed PID loop, taking in feedback from an encoder, is used. Whats PID you say? Continue reading! PID is a feedback-control toplogy for closed-loop control of a system. Open loop control is simple, imagine you want to control a DC brush motor, and you want it to turn 1 revolution. To do this, you could pulse the power to the motor momentairally and assume the loading on the motor is always constant. Unfortunatley, loading, wear, and other factors make this method very prone to error. Closed-loop control takes that goal of rotating the motor 1 revolution, and provides a feedback mechanism to observe the completion of that goal. The feedback mechanism could be as simple as a switch that senses when that one revolution has occured, or as complex as a high-speed multi-phase encoder. The values for P, I, and D effect the system's response to changes. PID consists of 3 terms, weighted together to achive the initial 'goal' its set to achieve. 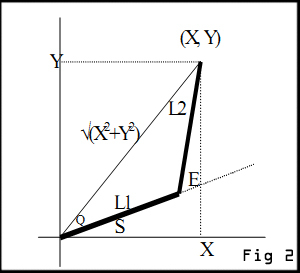 Proportional (outputs value proportional to the current error value), Integral (accumulated offset), and Derivative (rate of change control). 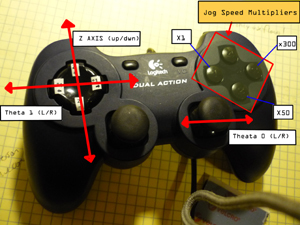 The theta0V2 controller preforms a high-speed PID loop taking a command (increase desired position), and attempting to push the motor to that position, using the encoder to verify it achieved that 'goal'. An example of the over/ undershoot with different constants is shown far right. Next I needed to see the bandwidth of the PID loop. A GPIO tied to an led was twitched each operating cycle. From the oscilloscope (right), we can see that the operating scan rate of the PID loop is roughly 217kHz. As the 'Step' input is tied to an edge-triggered interrupt, the 200kHz is the maximum rate the hardware can respond to the encoder inputs during the increment event. Far right is a view of the encoder inputs (green / purple) versus the commutating frequency of the motor (orange / blue). 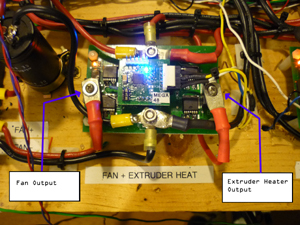 Initially i had been using the '2x resistor-block heater' extruder head, identical to one used on a makerbot-mk5, however after some frequent burn-outs, [literally the resistor insides coming out of the extruded metal shell], i upgraded to the cartridge-style heater shown below. The root of the resistor semi-frequent meltdown came down to component rating. That resistor was rated at 10W..... when operated at 25C, at 160C, it was rated to ~2 watts. I was pushing ~11W into the resistor at 160C, and after a few hours, the part failed. A number of other makerbot folks ran into this issue [Link]. 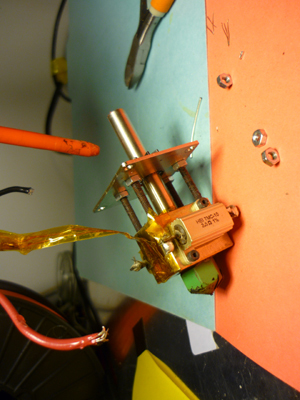 Cartridge Heater + Teflon wire and milled & tapped new heater-block-head. The heater [Link] is held in place with a small tapped hole and screw. The wire feeding power to the cartridge heater is Teflon/fiberglass coated and heat resistant. The extrusion head with new cartridge heater mount. This is re-connected to the DC extruder motor assembly. I kapton-taped the thermistor to the aluminum block assembly for temperature measurement. 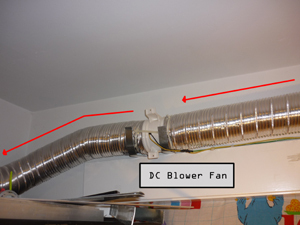 Why use such a large ducted fan? 200cfm just for a fume-hood? Because of the extended length of the duct i chose to overisze it. It is way easier to throttle down a large dc brush blower than constantly over-drive a smaller one. I ran the DC brush motor from one side of a Theta0V2 motor controller, switching at ~30kHz. 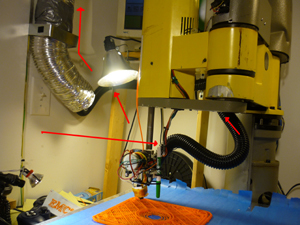 As the Exhaust fan only needed to blow in 1 direction, i was able to use half of the H-Bridge for the exhaust fan, and the other half for driving the extruder heater. The Acoustic noise wasn't the most of my concerns, as the motor was located ~10' away from the robot, i ran 12' of cabling to power it. As it turned out, switching 3A at 30kHz on a long wire made a wonderful antenna, generating a boatload of EMI. Enough EMI to cause the Theta 0 encoders to miss steps on occasion. I rectified the problem by adding a very advanced 'RF choke', shown far right. 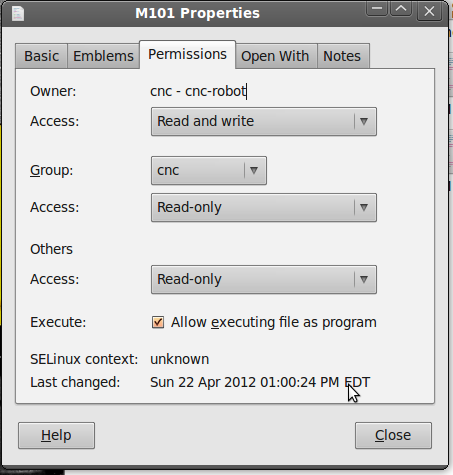 In Linux CNC, 2 files do all the configuration hard-work. INI and HAL. 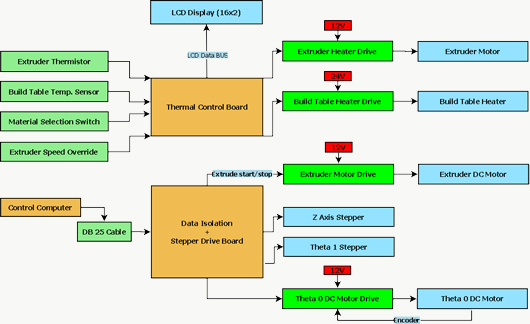 The INI file describes each axis's type, maximum and minimum speed, and homing locations, while the HAL file describes the hardware interface layer between Linux cnc and the external hardware. 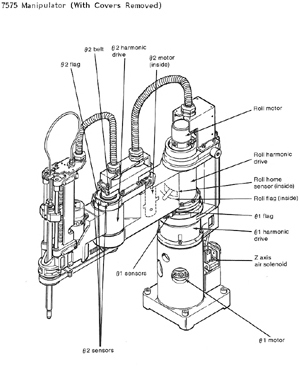 The Linux cnc package has some excellent, dense documentation on both the INI [link] and HAL [link] files. 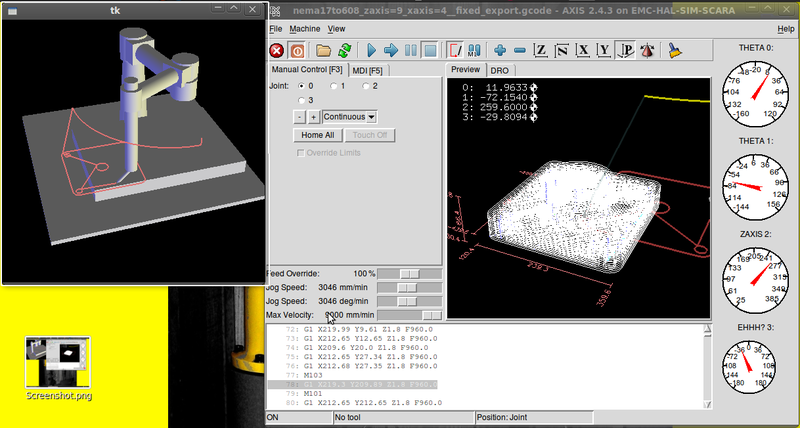 Shown right is the user interface, consisting of a 3d model displayed by tk (far left), and the gcode model with trace paths shown. The Axis data is displayed on the far right, and detailed below in the scara.xml section. Added in Image detection on import, an awesome feature that loads 'image-to-gcode' when a greyscale image with png, gif, or jpg extension is loaded. 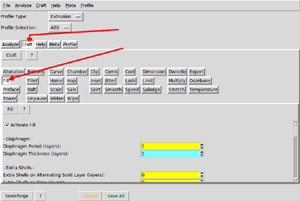 The Axes section sets each axis's parameters, input scales and setup for homing sequences. 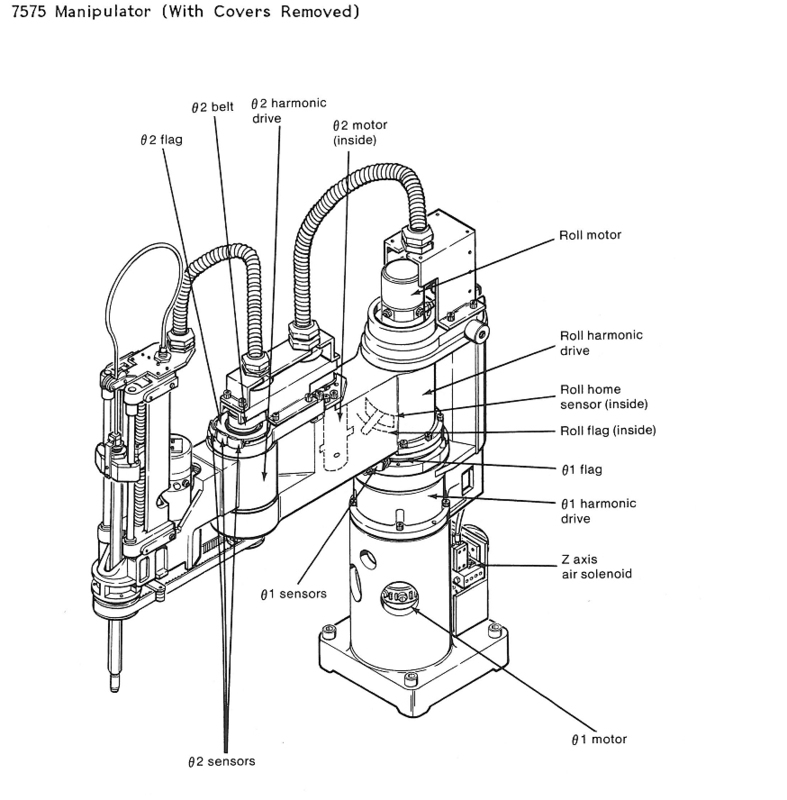 This is A HECKUVA LOT MORE COMPLEX than cartesian systems used in a makerbot style 3dprinter. Mixing stepgen and scara kinematics was a difficult exercise, there are a number of commented-out sections from the debug process. I ended up generating a servo-thread for each axis parameter (0-8) and then piped the output to the parallel port (parport, 0X378). 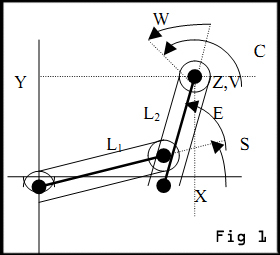 After stepgen was generating step-direction data, that is linked to the actual positions (J0pos, etc). 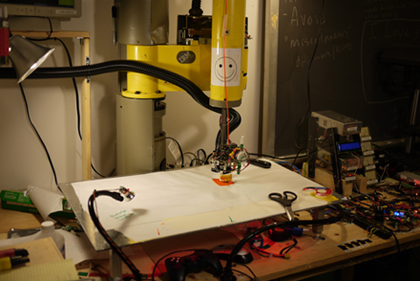 This acts as the feedback path keeping the robot actual positions bounded by the planned positions. To preform manual homing, or just putz around with a robot, i use a Logitec usb game controller. Its intuitive to use and more functional than virtual buttons. The following is a code-snippet from my initial M101 file. All this m-file does is call halcmd and set pin 09 of the parallel port to a logic '1' output. To verify that an M-File is executable, graphically, simply right-click on the file, goto 'permissions' and doublecheck that 'allow executing file as program' is checked off. Verify for each M-File you make. The Axis feedback display (while limited at the time of release of this project), displays each axis's position in a dial format. This file is stored as scara.xml in the config directory. An example of each axis feedback is shown (right). The rediculously oversized ms-paint arrows are not included. 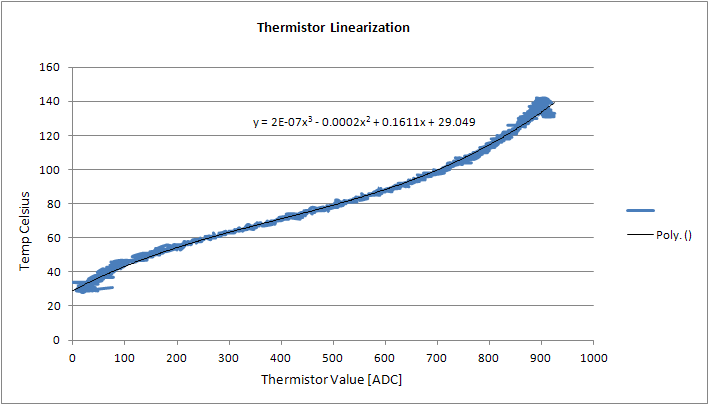 How linear is that thermistor? I started off with the makerbot MK5 print head, and with a few modifications (removing the plastic mounting base). 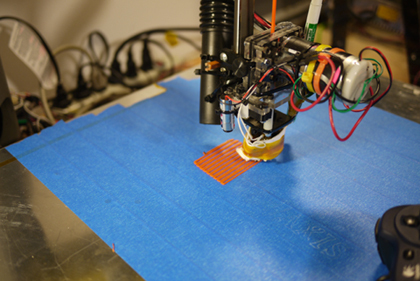 The print head came with a thermistor for monitoring the print head temperature. I had allready tied together a microchip MCP9700 [Datasheet] super linear thermal measurement IC with analog out, so i perched the two closeby, and DAQ'd the actual temperature vs the voltage response of the thermistor. From this plot, i excel'd a 4th order equation to convert the thermistor's non-ideal resistance / degree F into a linear plot. 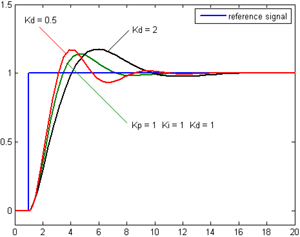 The following plot displays the resultant linearized thermistor output [From 150 F to 300F]. The microcontroller converts the analog 10 bit ADC, averages, and applys the difference of the two transforms above to plot actual temperature. They follow quite a bit better, and the differences in temperature can be attributed to a combination of the two sensors not being right next to each other. The advantage to this is extremely short warm-up times, due to bulk heating, and very limited overshoot for the temperature at the desired setpoint. The actual overshoot derives mostly from the fact that this is a non-feed forward reactionary control. 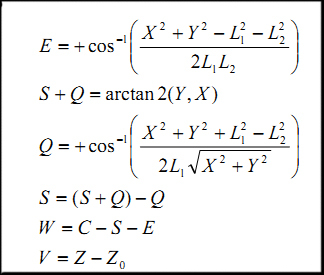 As there's a large thermal time constant for the extrusion head, input energy (heat) takes time to propogate through, this can be corrected for by factoring in the thermal mass of the extrusion head and a first order estimation of convection losses. Initially, for the extruder controller, a simple 'if extruder step = 1' extrude, otherwise, stop extruding. This does have some detrements, namely the 'dc-servo drool' issue. As shown on the pictures (right) between the central point and the outer parts, a whisker of ABS branches across. 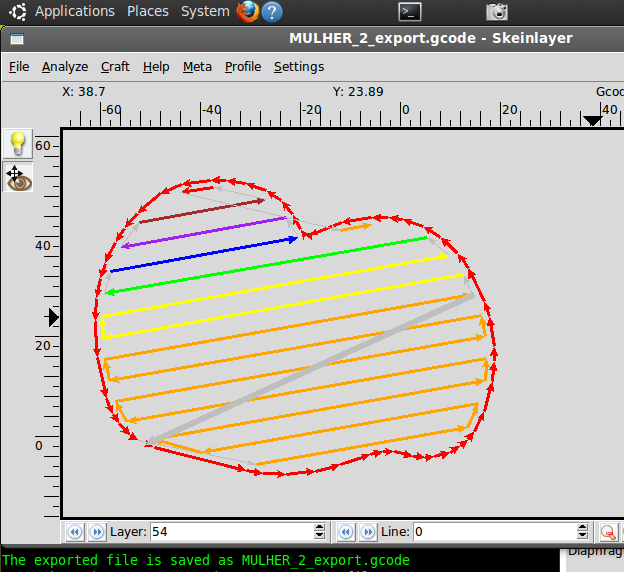 Skeinforge is an awesome splicer that grabs an existing 3d model, in STL format, and will slice it into a gcode path file, based upon input from the user. 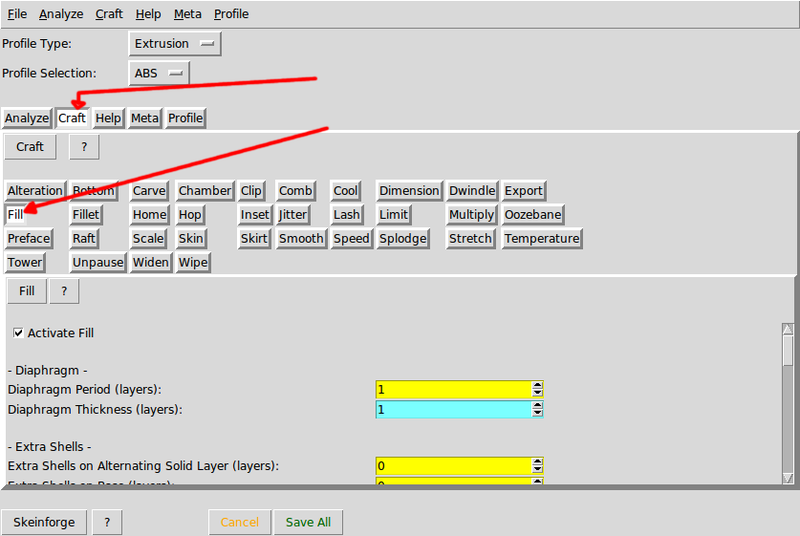 After tweaking the settings listed in skeinforge, save and close the script. 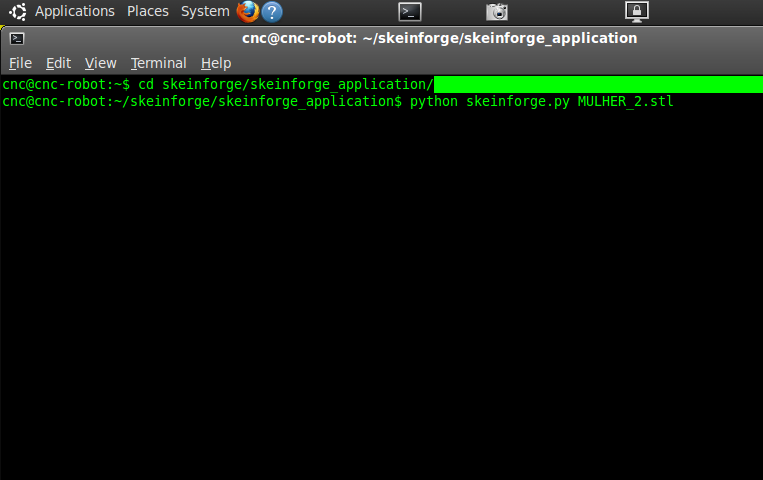 Using skeinforge to a STL model to Gcode is as simple as opening up a terminal,cd sk cd'ing to the directory its installed and running 'python skeinforge.py FILENAME.stl' where filename is the STL 3d model. In this case i had the STL model in the same directory as the skeinforge python script. 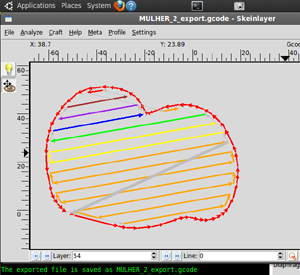 Skeinforge will create a FILENAME.gcode as an output file in the same directory as the initial file. I wanted to document some of the longer 3d prints (2 hours +) however, i lacked a camera that could record / had battery to run for hours. I snagged a used logitec webcam [link] and some microphone stand [link] and 6' of USB extension cabling to create a movable, positionalble timelapse camera mount. 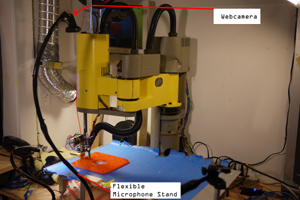 As the webcamera's mass is less than 100 grams, the flexible microphone stand can hold it in a fixed position without noticable droop. The microphone-stand assembly is bolted to the work surface. 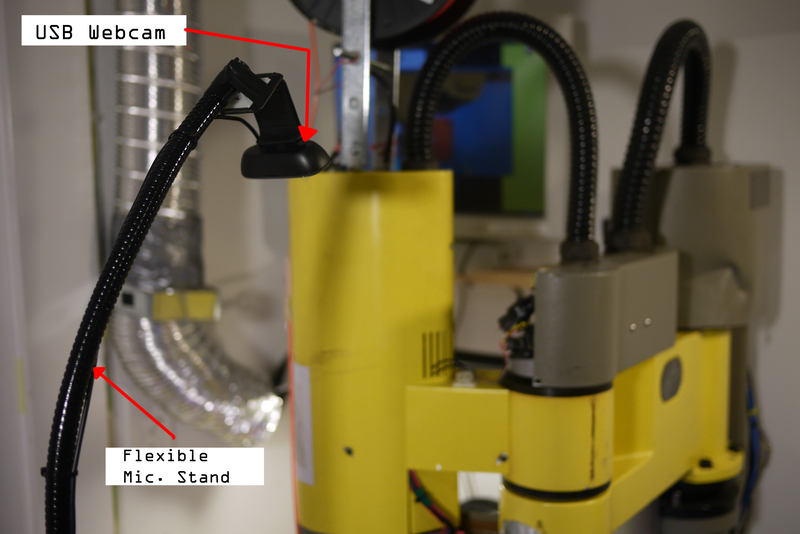 The only cavieat so far has been vibrations coupling from the robot to the flexible camera stand, resulting in a bit of wobble. It may be a better move to bolt the flexible webcam stand to a surface not tightly coupled to the vibration source. For the longer time-lapses where only 1-2 fps was needed, i created a python script. This was useful as it was far less resource intesnive, in comparison with running guvcview which, can cause a lot of system latency. The only dependency is uvccapture, which is installable by a simple 'sudo apt-get uvccapture'. This script takes a high-resolution image 2x / second and puts it in a folder labeled 'image_folder' in the same directory as the script. Each image has the system time as its filename. After complete, a ffmpeg script generates a giant AVI from the raw images. There are a number of other ways to accomplish timelapse ->pile of images -> avi documented on the net. I tried a number of work surfaces for printing ABS onto, ranging from saran-wrap all the way to waxy parchment paper [shown left]. Printing directly to the aluminum build table, even when heated, proved too dificult. Saran-wrap warped, wax paper was too compliant and the abs would easily dis-engage from the surface. Plain construction paper worked well, but was very difficult to remov e from the final print. As a result i 'painted' the projected build area in strips of tape, which was easy to remove from the work table, and wasy to peel away from the ABS printed part. After the first test prints were complete, I spent some cycles doing PID controller (theta 0) tuning. I was able to null out most of the over shoot to allow for strait lines and relativley crisp corners. Previously, oscilations were visible in the print. They were semi-periodic, i was able to caliper the distance between the peaks out, determine the difference, and tweak the error band used to tighten up the control loop. Initially i ran into some issues with corners warping up over time, but that was mitigated by turning the heated build platform up to 90C, which ended up pulling close to 300W alone. The start of the first attempt at a larger format print. Note that some of the corners are CA'd (superglued) down to halt the warping of corners. A standard twist-style mechanical pencil is sitting on the left hand side of the print. This print only occupies 1/3 of the build space. There were some issues on the print table's height tolerance, and as a result some areas were a bit less defined than others. Initially i hadnt noticed this, as the smaller prints occupy a fraction of the space. One of the main learning points for these larger prints is compounding errors. For the smaller prints, a missed encoder interrupt once every 100,000 encoder feedback loops wasnt horrible, but, as the print scaled up, the became more visible. With the newer heater upgrades and push for a faster print speed (2400mm/min), printing large tighter meshed objects became easier, this print is roughly 9.2 inches in diameter, 2/3rds of the max print size for this shape. A colleague showed off the latest from makerbot and I found the heated build platform temperatures were actually significantly higher than the 65C i had been running my build platform at. Previously i had been using ~60-65C, which was the max output. I added 2 extra heated pads (from marathon) and 2x200w 24v power supplies (awesomely donated from a colleague) to allow testing up to higher temperatures. The higher temperatures allow for printing without tremendous amounts of warping. Previously, i used superglue to tie down the corners of the print to the blue painters tape (shown, far right). While this worked short term, larger prints had enough thermal stress to pull up the blue painters tape and continue to warp. For this project, I ended up going through an inordinate amount of blue-tape, I probably could have saved a few dollars by purchasing 4-pack rolls of tape. I need to move to a faster code implementation / faster clock rate on the theta0V2 boards to allow for faster build/print times. Currently the DC-Servo motor controller is the limiting factor for speed. Further development could increase this speed by at least 4 fold. As a general note, i'm currently running way lower resolution than a commercialy available printers, namely due to the infant-esque stage that the printer is in, the skeinforge/gcode splicer parameters are still being tweaked, along with the scaling factors of the motor drives. The actual drive hardware may change to incorporate a micro with a faster maximum clock, to increase the maximum speed of the theta 0 axis. Also thanks to David B. for the pointers on his scara setup. Hopefully the documentation presented above will be of use for future EMC2 projects focused on 3D printing. 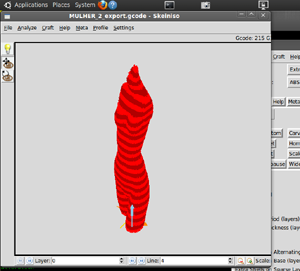 Finally, if the makerbot folks want to donate a fancy MK7 print head, i'd gladly adopt it into the land of ubuntu cnc and document my findings without any questions.